“The witch was chasing me through the dark wood, getting nearer and nearer by the second. It is close to a year since Tom became the Spook’s Apprentice. Now that he has mastered the art of defence against boggarts, its on to witches, and there has been no better time to target the witches. The three clans in the Pendle district are banding together and the threat against Tom and the Spook, not to mention the district in general, is growing by the minute. Tom and the Spook have just a few short weeks until the biggest threat which comes with the summer solstice, Lammas; where the witches are said to try and raise the devil himself. Tom and his master must find out which witch is leading the fray and catch her before its too late. I think this one has been my favourite Spook’s book so far. The witches are scary and fearless and Tom has a lot of choices to make before the story can move forward, It was the biggest book so far but it needed to be for everything it carried, and I did love it. The story was fantastic, you had the main stuff about the Witches, a lot about Tom’s Mam, Alice’s side of things and the rest of Tom’s family. Even the Spook had his on story with Father Stocks and I loved all of it. The witches were terrifying and I can imagine a younger person reading this may get quite scared, especially with the Lamias and things like that but I kinda wish I could have been younger reading the story as I would have lapped it up in no time even though I would have been terrified! The thing I love the most about the Spook’s books is that they really don’t take any reading. The writing flows so well that you can read a page in no time at all. I started reading on a Thursday morning at 7.30 and by 2 that afternoon I was on page 120… and I’d been at work for most the day! I got loads of the book read in my half hour lunch break and because its so good I just gobbled it up and was done by the Friday night. There’s a lot to take in but its all laid out in front of you so it isn’t hard work at all. The series is really shaping up and I’m starting to see things that may be clues to later storylines. I have a feeling that as the series goes on things are going to change and we might just lose people close to us. There is no shortage of death so far in the book and its a topic that is handled quite well so I fear there may be trouble ahead. Some of the things discussed already are prophecies and I am interested in one or two of them and if they are going to come true so I will definitely be reading on to find out! This series is a quick read, its long at (so to be) 13 books but its worth checking out, I think I’ve probably only spent around 10 hours on all four books I’ve read so far and each one of them have been good reads. Theres a niggle that I have a feeling wont be straightened out but thats a personal thing rather that a reflection on the authors work or the story. The Wardstone Chronicles are a great series for younger teens but may keep them up at night if read after dark! 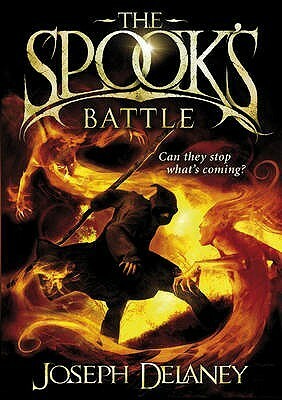 The Spook’s Battle is the fourth book in the Wardstone Chronicles series and was published by Red Fox in 2009. My copy was sent to me by the publisher in exchange for an honest review.